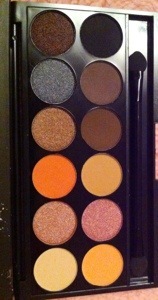 Recently my sister purchased a Sleek Palette from Luxola called Oh So Special. 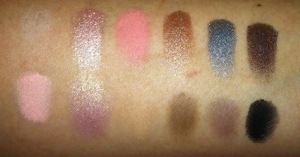 She wanted a more wearable day palette with more matte colours compared to the palettes I already own. I managed to take a few shots and swatches of this palette before she took it along with her and it has now become a staple palette for a “no-makeup, makeup look” *:P tongue twister… sometimesI am lucky to borrow the palette from her too. She purchased it at SGD 14 due to some credits from previous purchases. 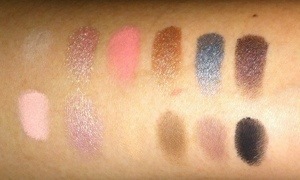 It retails for SGD 20 as all Sleek palettes are in the website. With credits and discounts available, I too pay less than SGD 20 per palette. BOW is great for subtle highlighting as it is more eggshell rather than white. 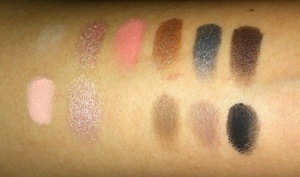 THE MAIL is more skin colour and is a very good blending colour for the crease. (add THE MAIL to your blending brush to diffuse harsh lines quickly). RIBBON and PAMPER are matte pinks. RIBBON is more of a hot pink whereas PAMPER is a neon/baby pink. They can be used with ORGANZA and GATEAU as the colours are similar. ORGANZA is peachy shimmer whereas GATEAU is a slightly lighter pink with dual tone shimmer. Although many love ORGANZA, I would say that GATEAU is my favourite just because it is hard to describe the colour. It has so many dimensions that it makes your eyes interesting. In a good way of course! There are 4 browns in the palette too. GIFT BASKET is a Light brown shimmer with lots of red undertones. CELEBRATE is a dark chocolaty brown shimmer. A nice alternative to black as it is very dark yet not over powering. 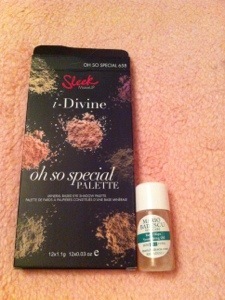 BOXED has more red undertones than WRAPPED UP which is lighter as well. 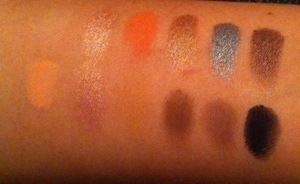 GLITZ reminds me of other pewter/tin colour shimmer eyeshadows from the Sleek palettes. Nice to have in the palette if you want to go for a more futuristic look. Not everyone can take this colour as it is pretty bold. You can tone it down by using it to line your lower eye line instead. NOIR is the regular matte black you find in Sleek palettes. Whilst many complain about having black in almost every palette, I find the black useful. I usually choose 1 palette to bring out with me for the day. To have a black and a highlight colour in each palette makes it convenient to travel around with. However, if you put on makeup only at home and you have multiple palettes available. You might then find it annoying to have so many black eyeshadows. 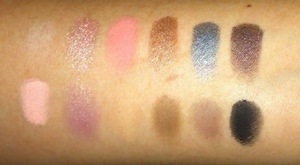 NOIR is very pigmented. Be careful of fall out though as it can smear all over. Friday is just 2 days away!!! Keep your spirits up Glamifys!